By merging typical Saigon architectural and stylistic details, architect Toan Nghiem of a21 Studio created a space that brings family together. Stacking roof layers, open flowering balconies, and an alleyway that serves as a living room, dining room, and outdoor playground are all filled with colorful, rich materials. Inside Saigon House, reclaimed and second-hand furniture lend history and spirit to the home. 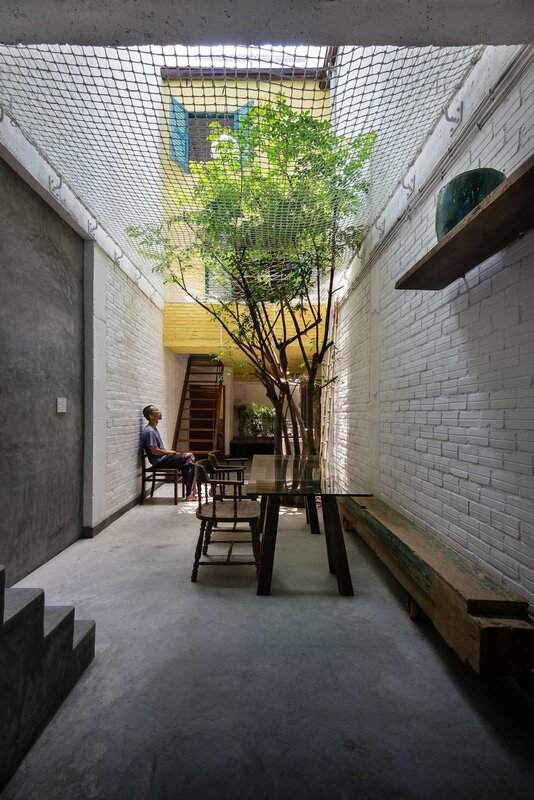 With so many small interior rooms and divisions between spaces, the addition of a net ceiling brings openness to the back alleyway, where the family often gathers to eat dinner. Not only does the net allow for ventilation and light, but it offers a place to play for the children, who love to climb and lounge above their parents.